8:51AM (all times in PST): Well, we're here... And we're a bit early. Not too many folks waiting around; we'll let you know as they start admitting. 9:27AM: Plenty of people here now, the usual suspects -- gadgetrati VIPs and, well, little old us. Admission in about 15 minutes! 9:36AM: Consensus of experts polled: "New iMacs, definitely." "It's a slam dunk." Well, there you have it, proof positive. 9:54AM: Ok, we're in, and seated. 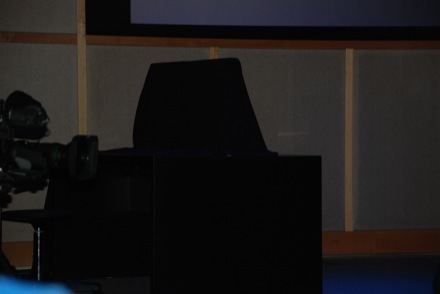 There's definitely a large object under a black cloak up on stage, it's either a big display (mabe a 30-inch or larger? ), or an iMac. We don't see any other products up there. 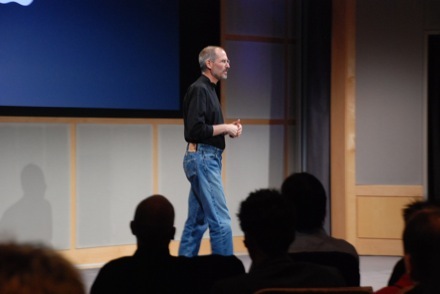 10:01AM: Steve just walked on stage. "Good morning, thanks for coming over this morning"
10:02AM: We're happy to do this in a more intimate setting at the Apple campus. We're gonna start with the Mac. Mac has had an incredible 12 months. Let's see how it's grown over that period. Mac has had very successful last year. Tremendous amount of momentum. Around three times as fast as the industry. We have a very clean product line. Today, focusing on the iMac. 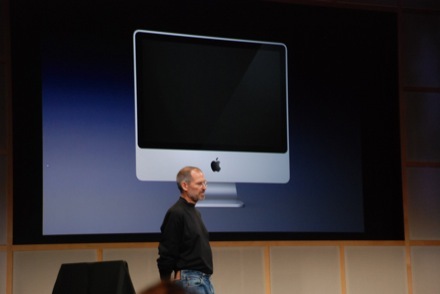 10:03AM: "iMac is an all in one desktop, we pioneered this design. This is an all in one world. Phones, iPods, laptops." He's dissing Dell, showing their design. 10:05AM: "Put everything all in one, clean up the mess. IMacs very successful, have everything you need. It really works. The iMac has been really successful. We want to make it even better. How do we do that? Two elements we've used in a lot of pro products: aluminum and glass. Phenomenal materials. Take aluminum, we use this in our pro products. Professionals love it. Glass, very elegant. Scratch resistant. Very desirable from recycling point of view. We're turning to aluminum and glass. Mac Pros, Mac Book Pros, aluminum and glass." 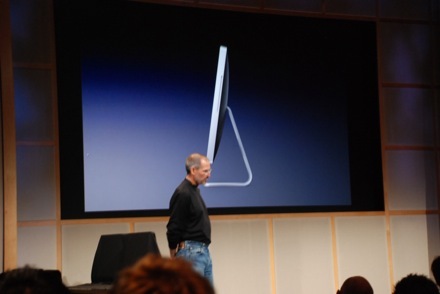 10:06AM: "This is the new iMac design, and it's just designing. 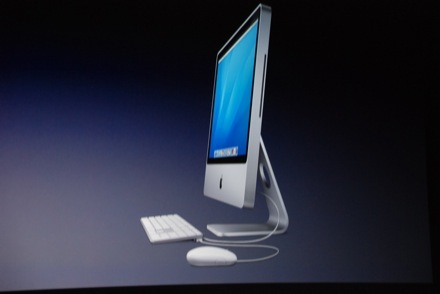 This is the new iMac. Just gorgeous. You can see we have a full complement of I/O across the bottom. USB 2.0, Firewire 400, Firewire 800. Slot load superdrive. 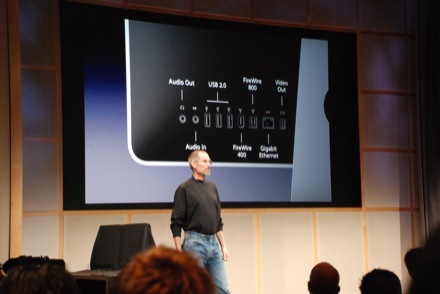 iSight camera and microphone. Can add memory with just one screw. 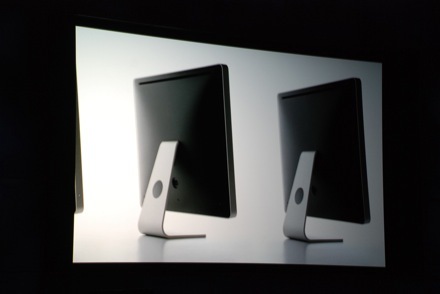 New iMac will come in two sizes: 20-inch display, and 24-inch display. Both will be glossy. Customers say they love glossy displays." 10:08AM: "Give them their assets as they're meant to be seen. New iMac. Also, new keyboard. You might have seen this on the web. Two USB ports. 0.33", full complement of keys, including dedicated keys for screen dimmer and brighter, expose, media controls, volume controls, eject for optical drive. 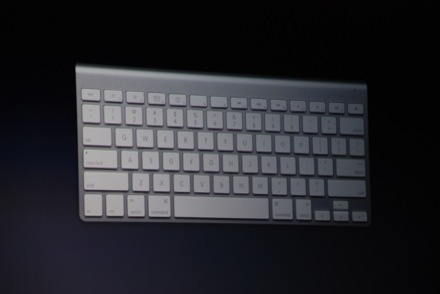 This is the new iMac with the new keyboard and mouse. Wireless? New wireless keyboard, beautiful, very compact. People love to hold them in their lap. Bluetooth 2.0, all these dedicated keys as well." 10:10AM: "What about the inside? Up to 2.4GHz Core 2 Extreme processor, up to 4GB of memory. ATI Radeon HD graphics card, up to 1TB of hard drive storage. 802.11n and Bluetooth 2.0 built-in. What models will we have? 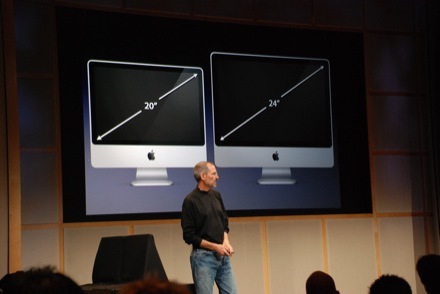 Up until now, 17-inch, 20-inch, and 24-inch. 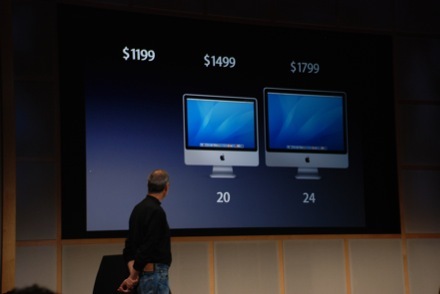 Well, today we're replacing the 24-inch, lowering price by $200, 20-inch at same $1499. replacing 17-inch with $1199 model." 10:11AM: Aluminum and glass design, incredible reaction from consumers we've shown this too. Say it looks even more with a high end consumer product. Pros say they think it looks more like a pro product. We're using very high quality plastics, glass, and aluminum. All models available starting today." 10:12AM: "Want to see our new ad?" New iMac ad plays. 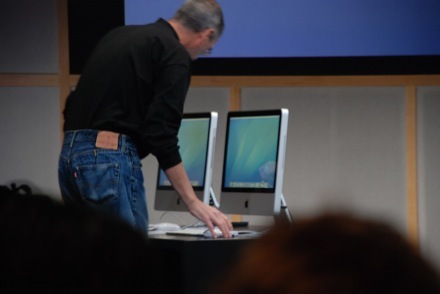 iMacs rotating slowly, and that's about it. 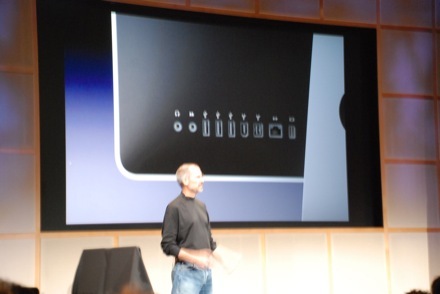 10:14AM: Note that the Mac mini is still pictured as part of Apple's product line. "Alright, next thing is applications that run on the Mac. Apple invented category of digital lifestyle applications. Computer is the hub of digital life. We've increased our lead over the PC industry. 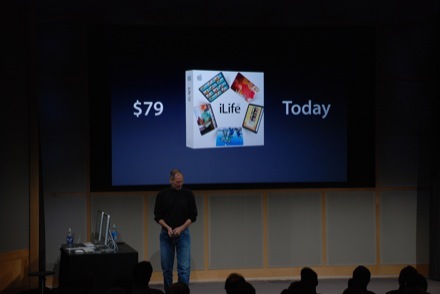 Introducing iLife '08. Totally new, biggest jump since we introduced it. 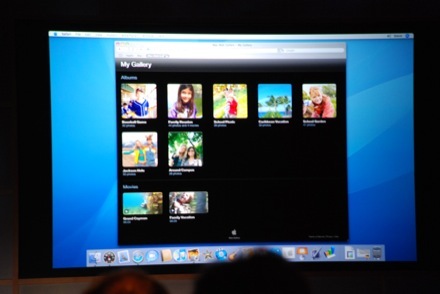 iPhoto, iMovie, iWeb, iDVD and GarageBand. We're replacing one of the apps with something that takes it to a new level." 10:18AM: "iPhoto. We're adding "Events". Digital cameras have made it so easy and inexpensive, photo libraries have grown, not unusual to find photo library with 5 or 6 thousand photos. It's getting hard to find 'em. We make albums, go to some event, take photos, and look what's happened. We have tons of albums. They're centered around events. Birthday party, family reunion. We label the albums. We have a computer, we could do this automatically. 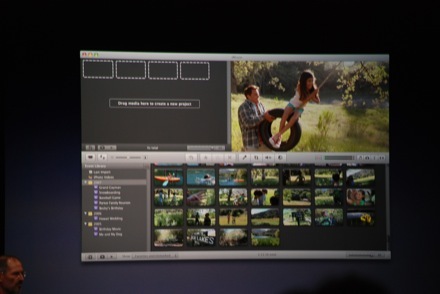 Automatically makes events out of your photos. Around 50 photos avg per event. What that means is, instead of looking through 5K, you're just looking through 100 events. Makes photos manageable again. What photos go in an event? When it automatically makes an event, what does it do? All photos taken in a day. All photos yesterday, put in an event. photos taken two days ago in an event, and so on. What happens if I go to a b-day party in the morning and wedding in the afternoon? Just pick first photo and splits automatically into two events. 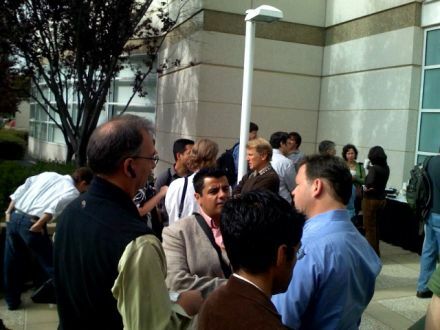 Multi-day events can be joined together into single event." 10:19AM: Sounds like a fancy way to organize albums, doesn't it? 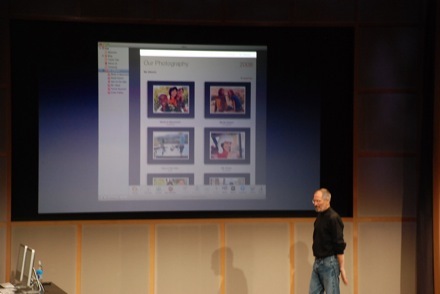 10:25AM: "With iPhoto '08, can hide photos and see only ones you like, but then later bring them back and view them. Only see photos starred three stars and above. Copy photo adjustments for a single photo and paste them into the rest of the pics you've taken at the same time. New books and calendars. Dust cover on the front. Calendars have been popular, offering ones that are 75% bigger at the same price. I need to show you this to understand. I happen to have new iMacs here. Going into iPhoto right here. I've got roughly 5000 photos in this library. Big library. So this is the photos view, this is the events view. I can easily scroll through 104 things, vacations, parties, trips. Very easy to find what I'm looking for. Move mouse over an event, it shows preview, called "Skimming". I can open up event, look at all the photos. If I pick another photo I like to represent that event. Pick which photo you like. Very simple. Once in, we can look at the photos very easily. Double click and instantly preview for you. Saves a ton of time. Don't have to go into edit mode. Really, really great. Now, let me go into 'Becky's Birthday". There was a wedding that afternoon. I want to split. Go to first pic of wedding, hit split. Type "Annie's Wedding", now I've got another event. When I go back, have birthday party and event. Pick a key photo for that event. I can also merge events. Have two events. Trip to Mammoth Lake, can hit "merge" or just drag one event onto another." 10:27AM: "Very straightforward to manage events. Here are photos of girls with balloons. I don't want to throw them away, just hide them. Option to show hidden photos. Very, very simple. Gonna show you searching. Find all photos tagged with "Connor", sorted by event. Look at things by date or rating. Sort by just five star photos. Groups by event, finds 26 photos. 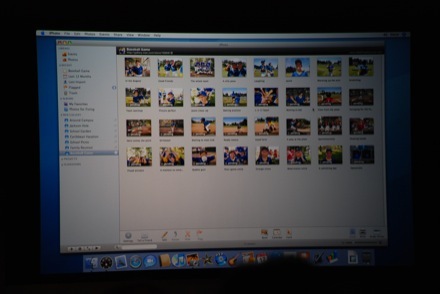 That's an overview of iPhoto '08." The crowd starts clapping, which seems a bit unnecessary. 10:30AM: "When you get your hands on this, you'll think it's great. We're all familiar with .Mac. It's our internet subscription service. We're pleased to announce we have over 1.7M .Mac subscribers, we're going to see it grow even faster after today. Marry .Mac and iPhoto. Announcing .Mac Web Gallery. Works hand in glove with iPhoto '08. What does it do? Has one button photo sharing. integrated into iPhoto '08. Makes web gallery, uploads automatically. Users get rich Web 2.0 experience [Did Steve really just say "Web 2.0"?]. You can see photos in gallary, mosaic. can see in any browser you'd like. Now people that view photos, if you let them, can download print quality downloads. Users can contribute photos from anywhere. You publish on .Mac, someone is on a PC, there is special email address they can get from the web gallery, and they will appear on your web gallery. 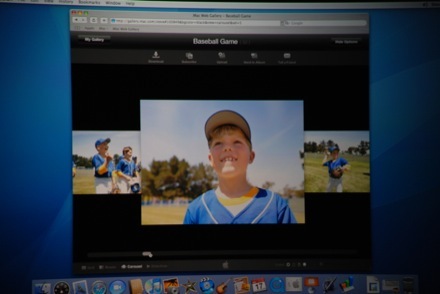 Photos will sync to your iPhoto library, too. 10:32AM: "Out with your iPhone, we've added "Send to Web Gallery" on your iPhone. Pick one, emails to special address, that photo will show up on your web gallery. Can tell friends about it, View others' web galleries right on your iPhone, great iPhone experience, fully integrated." Demo time! 10:35AM: "Here we are, back in iPhoto. Gonna say, publish this. Who can view? Anyone, family, friends? Allow users to download? Allow to upload? Allow uploading by email? Show email address to visitors? Communicating with .Mac, uploading photos. Now you can see the pictures uploading. What we're gonna do is go ahead and miniaturize, and go to Safari. Go to my .Mac web gallery. Already have a bunch of other galleries. I have skimming right on the web page. This is a true Web 2.0 app. Web app behaving just like iPhoto on my desktop. Look at individual photos, get information about them. It's pretty neat. Can view in different ways, view as mosaic, just click around, can resize photos in mosaic to any size I want. View as carousel, scroll around like this. I can view as a slide show." 10:36AM: "Now I want to show how easy it is for other people to contribute to my .Mac web gallery. 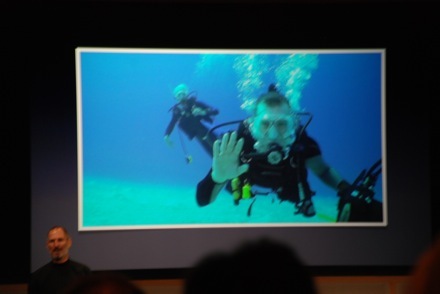 Phil Schiller has his iPhone, has snapped a photo, gonna send to my gallery right from his iPhone. Went right into my .Mac web gallery. Will auto download to my iPhone as well. Going back to my gallery. So that is .Mac Web Gallery." 10:38AM: "Next up: iMovie. This is really interesting. Let me tell you the story. One of our video engineers went to the Cayman Islands, shot a lot of underwater HD, wanted to make a video for his buddies in half an hour. We found out couldn't do it. Engineer got out Final Cut Pro. Couldn't do it. Couldn't do great movie in 30 minutes. So he created an app that could do it. We were so blown away that we decided to use it. We're still calling it iMovie, but we're giving a new icon so we can show it's a whole new app. One library for all your video." 10:42AM: "Got one library for all video you've shot. Can scroll through it all just like your photos. Can rediscover and enjoy all your video as well as make movies more quickly. Takes video from any source. HDV, still cameras that do video, brand new AVCHD camcorders. This new Panasonic one is the best. Records hour of super high quality video on 8GB flash card. Skim to preview, doing for photo, why not for video? Can skim through it in faster than real time. Completely -- it's a far superior way to find stuff in your video library. Allows for super fast movie creation. Select video like you select text. Build a movie almost instantly. 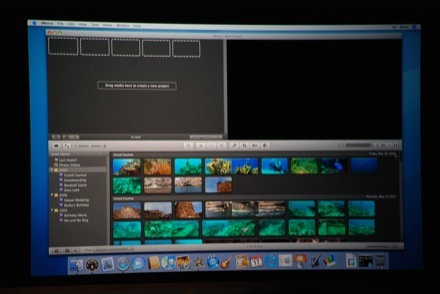 Add polish quickly, add music, sound effects, can drag photos, great titles, great transitions. All sorts of effects. Can view and share almost anywhere. This is the real key. You can go to share menu, make version for iTunes. Watch on computer, iPod, iPhone, Apple TV. Put on .Mac Web Gallery." 10:43AM: "You can decide to have encoded in multiple resolutions. Large resolution is higher res than DVD. No more sending DVDs to friends and grandma. They're going to see in higher res than DVD. You may want to send to the world. Can send to YouTube, will encode and upload it for you. Some great features." Demo time! 10:48AM: He's putting together some snowboarding clips. "And of course, don't have to settle for two second clips, can make these clips longer. " Steve is making a video on the fly. Adding a soundtrack, Red Hot Chili Peppers song. Now we're watching the movie full-screen. 10:51AM: Lots of applause. "We're slinging around HD video we've taken. You can imagine making a movie in 20 minutes. It's very well thought through. Can share it, pick resolutions that I want. One of things I want to show you is .Mac Web Gallery. put a few movies on there. You can see, it's higher res than a DVD, anyone can see this. This is the movie our video engineer made. You can make it in 20 minutes and put it on the web. This is a much better and much faster way to do it. There's a mobile resolution for watching on your iPhone. If you want, people can download to their own computer as well." 10:52AM: Pretty neat, huh? Somebody asked me, you guys are so far ahead of everyone else, why are you obsoleting your own products? I's because we really care about this stuff. To be able to put movies and libraries out there for everyone to enjoy, it's just great. We think more wonderful movies will be made and shared." 10:55AM: "So now I'd like to talk about iWeb. Enhanced version of iWeb, make even better websites. Live web widgets. Add GoogleMaps, we've made it so you can put it right in. You can add any web snippet, paste it into your website. 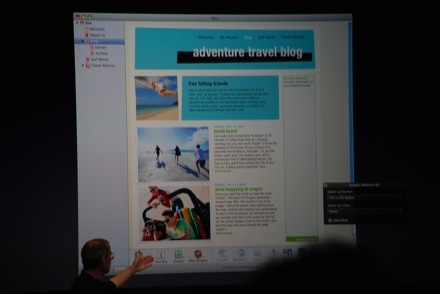 Live web widgets. Another thing you can add is Google AdSense. Register with Google, type in registration, decide what format, Google will put ads in there that are appropriate. Media index page. A lot of us have sites with photos on them, we'd like index page. We've added that, you can create index page, add your content in. Page with all the photos. Taking up just one position in the navigation. Put pointers to .Mac page as well. Personal domain support. If you have a personal domain, that's now supported. Themes, you can change theme now if you like. We've shipped some great themes. This is iWeb in iLife '08"
10:55AM: "iDVD. There are some people who still want to make DVDs, we're adding pro encoding, new themes. Really high production values. 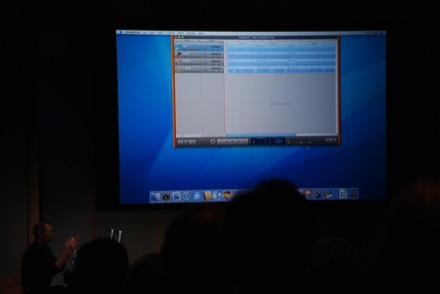 We're making it even better with iDVD and iLife '08"
10:59AM: "GarageBand, multi-take recording. 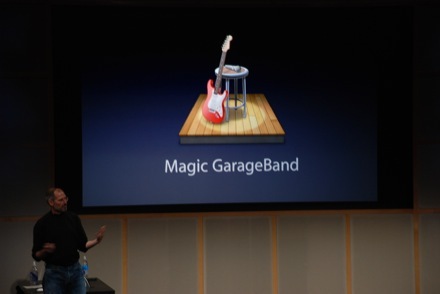 Magic GarageBand, way to experiment, best way to communicate is just to show you. Let me show you." Demo time! "Magic GarageBand gives me genres to play with: blues, rock, jazz, country, reggae, funk, latin, another rock style, and slow blues. I'm going to audition latin. Gives me little jazz club with my instruments." Looks like you can switch instruments playing each part of the preloaded track. Changing violin to trumpet, removing the drums. "When I've got something I like, can add my own voice and instruments, loops, change around however I want to. Way for musicians and non-musicians alike to get into GarageBand. 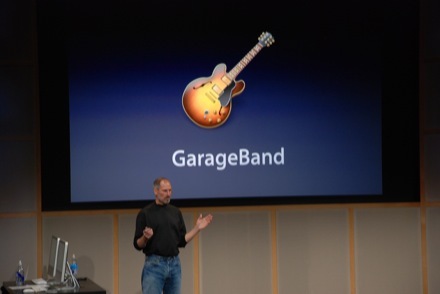 That's GarageBand. 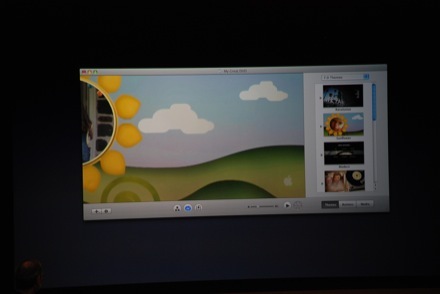 And these are the five new apps in iLife '08. Sells for just $79, one of the best bargains on the planet. Available today." 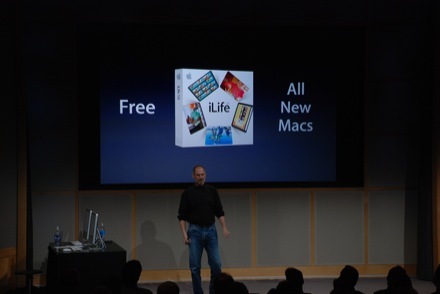 11:01AM: "iLife ships free with all new Macs, starting today. That's iLife. We talked also about .Mac. Series of great services, now we're adding Web Gallery. Also, offering 1GB of storage. That might be a little small. Offering all subscribers 10GB of storage. 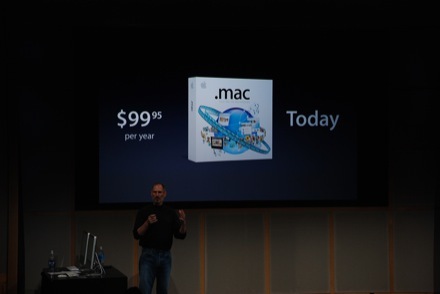 .Mac $99.95, one year subscription." 11:05AM: "That leaves iWork. 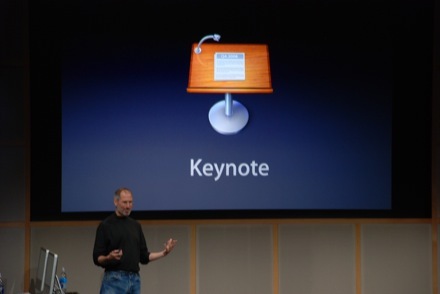 Keynote and Pages. I'm very pleased to announce we've sold 1.8M copies to date. New iWork '08. New Keynote, new text effects, new transitions, Instant Alpha. Instant Alpha, get a photo, lets us take out the background, just keep part of photo you want. Smart Builds, lets anyone make very high production value animations. Go to Media Viewer, drag photos in, anything you want. Keynote generates animations for you. A to B animations, you can create your own animations. Easily build slides that mere mortals can figure out to use. Great new themes that are really beautiful. Of course you can add animations to these. These are so easy, so easy to make slides that look this good. 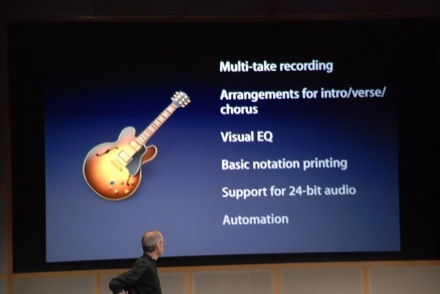 So, these are just some of the features as part of Keynote '08." 11:06AM: "So Pages, this is a word processor optimized for page layout, but some wanted just as a word processor. So now it's super easy to do both. Want WP, just get that, want page layout, get great page layout. Distinct modes. Get contextual format bar. Text, photo, table. Built-in change tracking, compatible with Word document. And 140 Apple designed templates, have cool templates built-in. So that's Pages." 11:09AM: "We've got Keynote and Pages, but when you think of productivity, think of third app: Numbers, a spreadsheet for the rest of us. Done in the style of Keynote and Pages. We've got intelligent tables. Readable formulas. Checkboxes and sliders. Sort and filter, pick column and just sort. Simple stuff. Flexible canvas. Want to change formatting of one part without screwing up the other part. Numbers lets you have multiple formats on single page. Move things around. Charts, images, and text labels. Can make gorgeous looking spreadsheets very quickly. Interactive printing, if I want to print, can scale easily to fit everything on one sheet, or move things around to put on different pages. Customizable templates, use what we supply or create your own. And of course, import and export all Excel documents." Demo time! 11:12AM: Steve's demoing different features, showing charts adjusting in real-time, readable formulars, showing how easy it is to change templates. "Numbers completes our productivity suite. 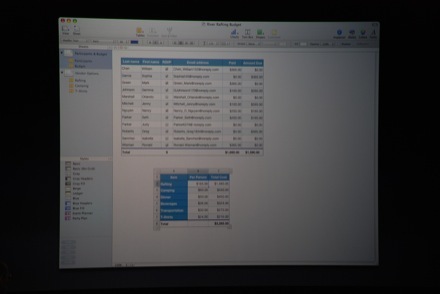 iWork '08 is $79, available today." 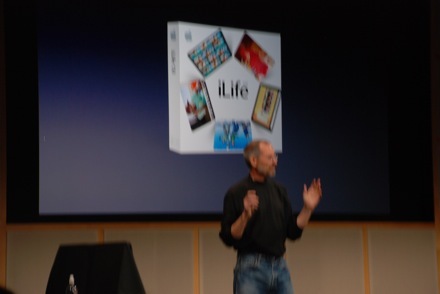 11:13AM: "We've got iLife '08, .Mac, iWork '08, all work with Tiger, all will work with Leopard when we introduce it later this year. This is what we've got for you this morning. We can do something we don't normally do because of this more intimate setting: Q&A." 11:13AM: He invites Tim Cook, Apple COO and Phil Schiller, EVP Product Marketing up on stage. 11:14AM: "How well will you market this ecosystem to consumers, and show how seamlessly all this stuff works together?" Steve: "We've got a phenomenal customer base, they show their friends and their friends get jealous." "Why are you not participating in Intel Inside program and not putting stickers on your Macs?" Steve: "What can I say? We like our own stickers better. Don't get me wrong, we love Intel, combined with our OS, we've really tuned them well together. Everyone knows we use Intel processors, we'd rather tell them about the product inside the box." Phil: "Too much stuff on PC box, stickers on laptop, trialware, You don't have to peel stuff off." 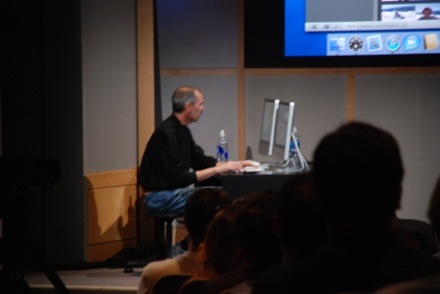 "How thin are the iMacs?" 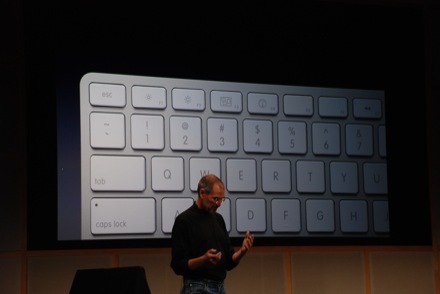 Steve: "Really thin. You'll get your hands on it in a minute, but they're appreciably thinner." 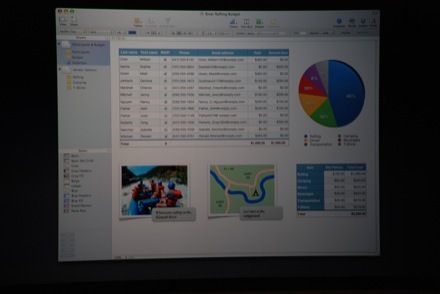 "Two thirds of your products on mobile side, where do things go on the Mac side." 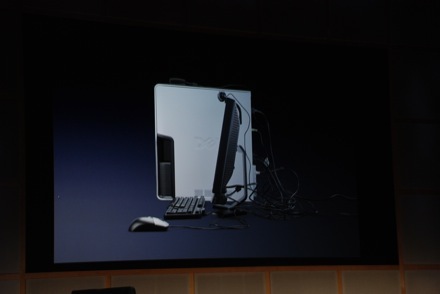 Steve: "Desktops still an important part. Don't require miniaturization of notebook, can offer bigger keyboards, screens, lower cost. Some consumers will want to own both. 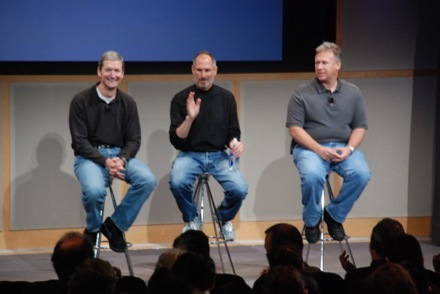 We think iMac has bright future ahead of it." "Didn't mention Mac mini today, how is it doing?" Tim: "We're refreshing the Mac mini today." "Mentioned AdSense, what's the relationship between Apple and Google?" Steve: "We are working closer with Google, they offer back end services we want to tie into our offerings. Google likes our products, too." 11:20AM: "Looking at what you've done with the iPhone, there's volatility in the stock. How satisfied that the product is on track?" Steve: "We think the iPhone is a pretty strong success, we think most of the world sees it that way too. We're really happy with how it's going." "How is Apple TV today? How does it fit into Mac?" 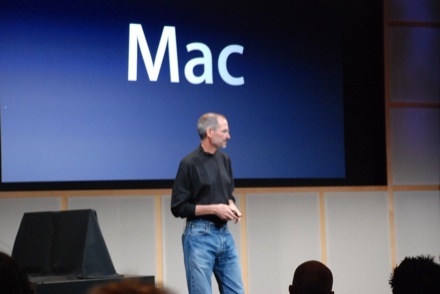 Steve: "We're here to talk about Mac, we'll have some news for the Apple TV soon, but nothing to talk about today." 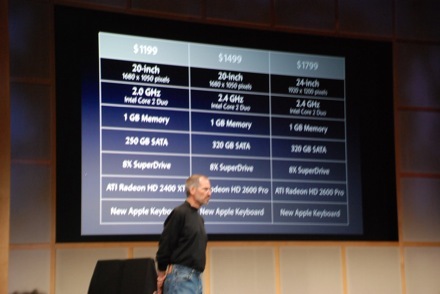 Steve: "We use Intel chips"
"What about the iMac in business?" Tim: "We're seeing a lot of growth in business use. 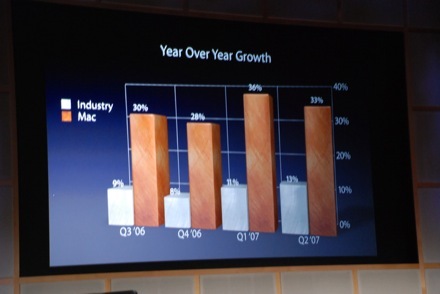 Mac is growing and a lot of that is business." 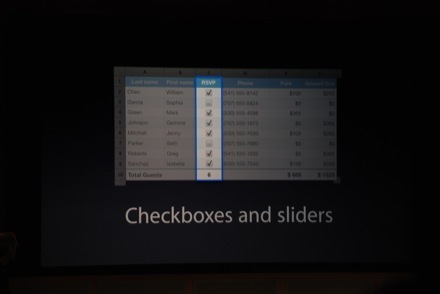 Steve: "A lot of other apps that run on the Mac, MSFT Office. But don't discount that more and more of business is communication, so lots of people have to sell internally, and they're excited about the tools we're offering. 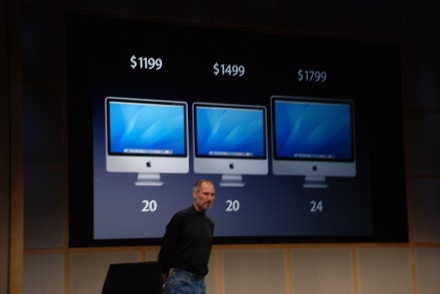 We see the iMac having some traction in business." "With someone editing movies and going to publish, why not support HD uploads?" Steve: "We do. Turns out that HD camcorders don't have sensors that are full HD, so they produce images that are slightly lower than HD, but are still stellar. We use that res, which is close, but not quite HD. Best you can do under $10k" Uh, that's not quite right, is it? 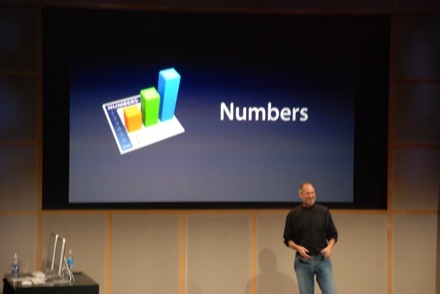 11:25AM: "Introduced multitouch on iPhone, what about for the Mac?" 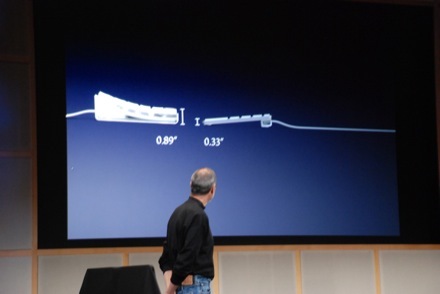 Steve: "Makes sense for the iPhone, not sure it makes sense in the Mac. Classify that as a research project." 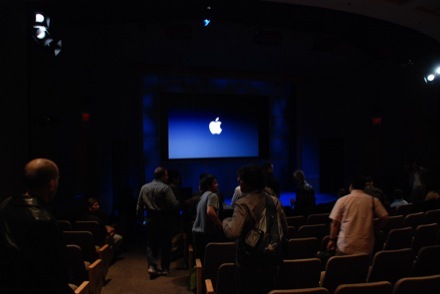 11:30AM: Last question: "There has been a suggestion that Apple appeals to smaller elite than mass customer base. Is it your goal to overtake PC in marketshare?" Steve: "Goal is to make the best PC in the world, and make something we can recommend to family in friends. There is some stuff in our industry we wouldn't be proud to ship. We can't ship junk. Thresholds we just can't cross. But we want to make the best personal computers in the industry. Our products are usually not premium priced. Price our competitors' computers, and add in all the extras, we're competitive. We don't offer stripped down products. We compare favorably. Thank you very much for coming today."